Soundwave 2012 was epic. 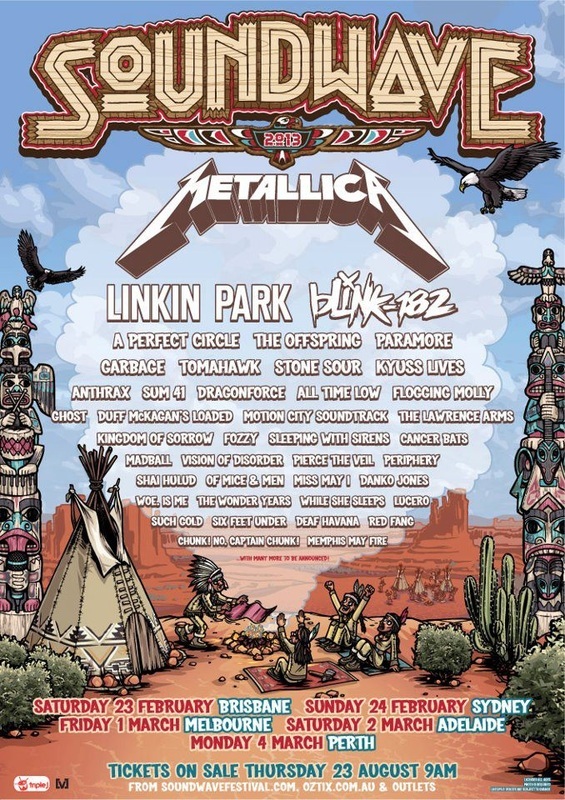 Many wondered whether the festival could ever top a lineup that featured System of a Down, Slipknot, Machine Head, Marilyn Manson, Limp Bizkit, Sisters of Mercy and many, many more. Well, guess what? They have! There have been many rumours, some based on fact, some on speculation, with festival promoter and Twitter aficionado AJ Maddah offering many tips and leaks himself. A read through AJ’s twitter feed reveals a number of items of note. There will be a second announcement, some time after tickets go on sale, which AJ says “is a damn good festival by itself IMHO". There will be no sideshows for Adelaide or Perth and no sideshows at all from Metallica, A Perfect Circle and Paramore. Blink 182 will be doing a solo show, most likely in Sydney. As for that second announcement, so far, Gallows and Puscifer have let it slip that they’ll be joining the party in 2013. Tickets will cost $187 and this time around there are no additional postage or booking fees, although punters in Sydney and Perth will pay an extra $2 to cover the cost of public transport.